Think the Turks & Caicos is only about relaxing on the beach? NONSENSE! Have your clients try out cliff jumping in West Caicos, zipping around a cargo ship in 7 feet of water on a jetski, snorkel the world’s 3rd largest barrier reef and see a humongous spotted eagle ray swim by. Throw in some kite surfing lessons and your clients will be hooked, just like us! Guests of all ages can take an active role in protecting the Sea Turtle population of the Turks & Caicos. Resident naturalist Jaclyn leads the way as you track and tag sea turtles in the wild, helping to provide insight into their breeding, foraging and migratory behaviours. Adventurous travelers like luxury experiences as well, which is why we've combined the best of both and offer a fine selection of vessels that will cater to adventure your clients might be looking for. Experience the thrill of riding through crystal clear water, a truly memorable experience. Experience the wonder of the smaller pristine cays and stunning secluded beaches that are not accessible by a boat. Buzz through the mangroves and enjoy the natural beauty of the inlets and waterways that connect the cays. Zip around the famous La Famille Express, a general cargo ship that ran aground during Hurricane Frances in 2004 and now sits in 7 feet of water. 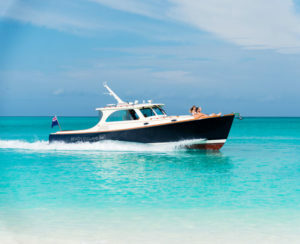 On this Robinson Crusoe type adventure, you'll travel to the shallow waters of the Caicos Bank where the fish are plentiful. Fish for some of the greatest tasting fish of the Caribbean waters including Snapper, Grouper, Yellow Tail, Jacks or barracuda.